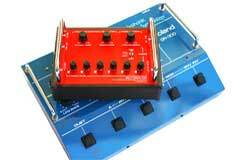 Incorporates circuitry and design concepts by GR-300 authority Mark Smart! Weight: 2 lbs 12 oz. 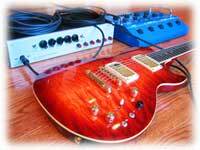 "I've been a Roland guitar synth user for a little over 20 years, and I've owned almost all of the units from the GR-300 to the virtual guitar units VG-8 and 88. 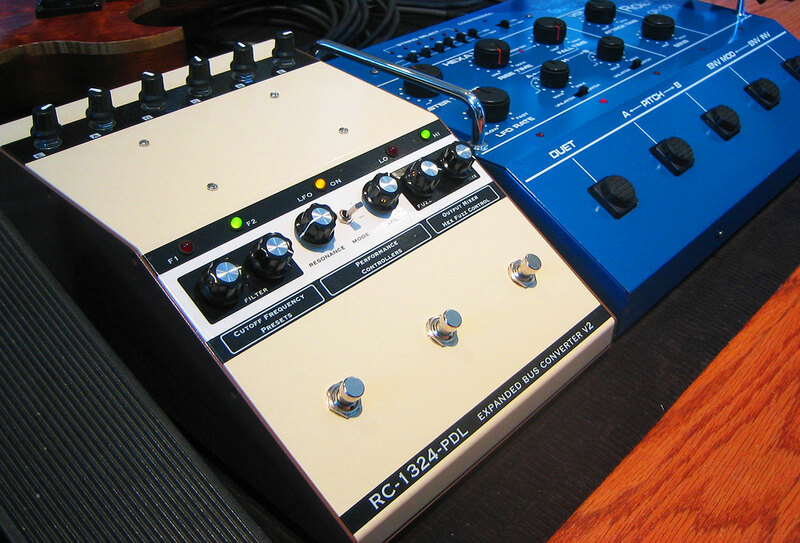 The RC-1324 is the unit I've wanted for years! It bridges the gap between 13 and 24 pin devices flawlessly. The build quality is first rate and I swear my GR-700 tracks better with my 13 pin guitar than the 24 pin original. Outstanding; Fripp is gonna flip when he gets this!" 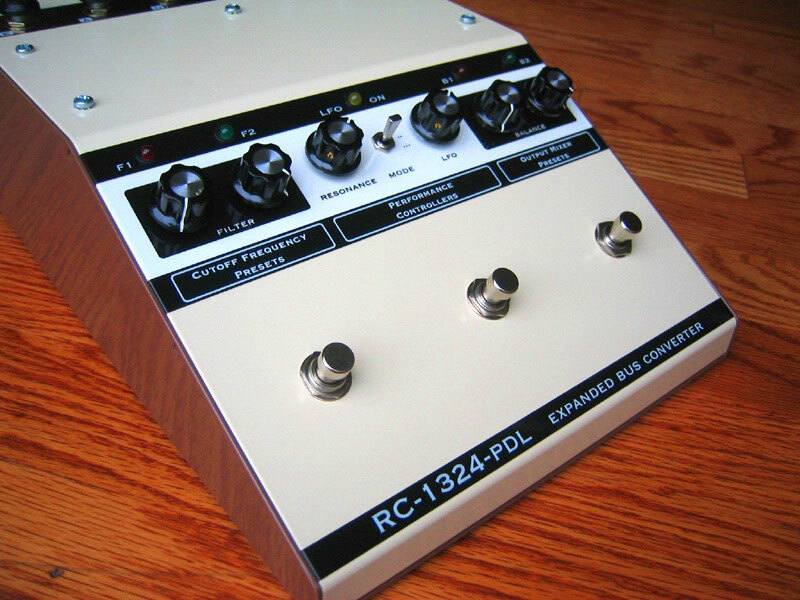 I designed the original RC-1324 after receiving some requests to build a "reverse BC-13" a unit that would allow a modern, 13-pin guitar, to play a vintage 24-pin guitar synthesizer. The real push came when I got an email from Vernon Reid, an innovative guitar player whose work I admired. 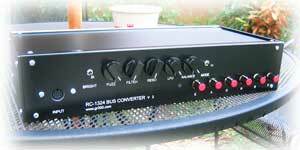 As it turned out, Mark Smart had already suggested the basics of how to build such a converter, using op-amps to boost the 13-pin signals to the 24-pin level, plus supplying a +/- 7 volt power supply, appropriate for the modern Roland controllers. I refined the basic idea, adding essential control voltages for GR-300 parameters like filter cutoff, resonance and low frequency oscillator. Included is the current design is a hexphonic fuzz circuit, based on the design of the Roland G-202 guitar. 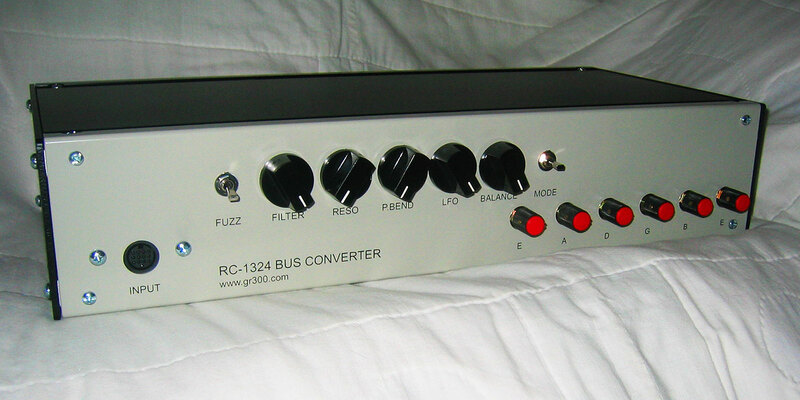 The latest RC-1324 converter is the RC-1324-VR, "Red" which was built in a new, slightly larger enclosure, with the return of the top input trimmer controls found on the earlier RC-1324-PDL series. While I tried to keep all the features of the RC-1324 series purely functional, I added large, chrome handles on the RC-1324-VR series just to make the unit look cool when used with a Roland GR-100 or GR-300. There is also a subtle difference between the unit made in 2011, and those made in 2012 and 2013. In the 2011 units, the guitar control voltage (#10) is zero. So if the 2011 RC-1324-VR is used with a GR-300, the output is always synthesizer only. 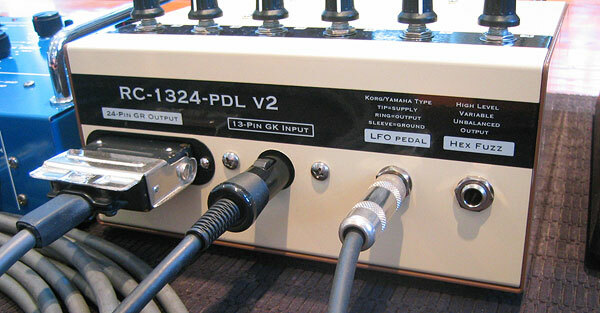 The standard 1/4" output on the RC-1324-VR provided access to the guitar output. After receiving some user input, I designed the newer units with the guitar control voltage (#10) at 100%. 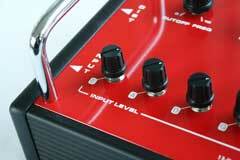 With the 2012 units, it is possible hear the normal guitar signal through the GR-300. YouTube video of the 2012 "Red: RC-1324-VR with GR-300, and Roland GK-3 equipped Schecter Stiletto Classic. Rather than the vintage, Roland 24-pin connector, some of the RC-1324-VR have on a feature suggested in 2008 by George Ludwig: a DB-25 pin connector with a special 25-pin to 24-pin cable. The use of the DB-25 pin output was liberating, I was able to use the unit with modified US-2 Turbo Unit Switchers, GR-700 with MIDI Input, and other synths, such as a Korg Z3 with a 25-input jack. The RC-1324-V5 was an attempt to roll back some of the features the RC-1324-PDL had acquired, and focus on the essentials. The V5 is essentially a V3 pedal with the improvements in the gain structure and hex fuzz circuit, but without the bass input switch, etc. The RC-1324-V4 was a revision of the previous unit, but there were no major new features added. 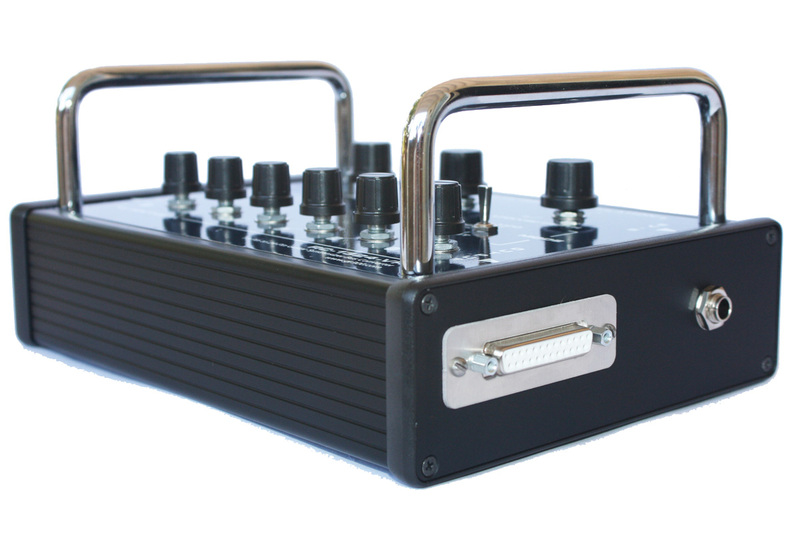 While the previous units used the Korg/Yamaha pedal standard for the LFO pedal, etc. version 4 switched to the Roland EV-5 standard. 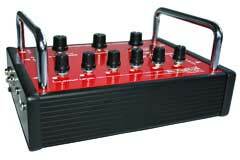 Also, the input gain structure was changed to enable more gain, and different diodes were used for the hex fuzz circuit. Click here to watch a YouTube clip of the RC-1324-PDL-V4. 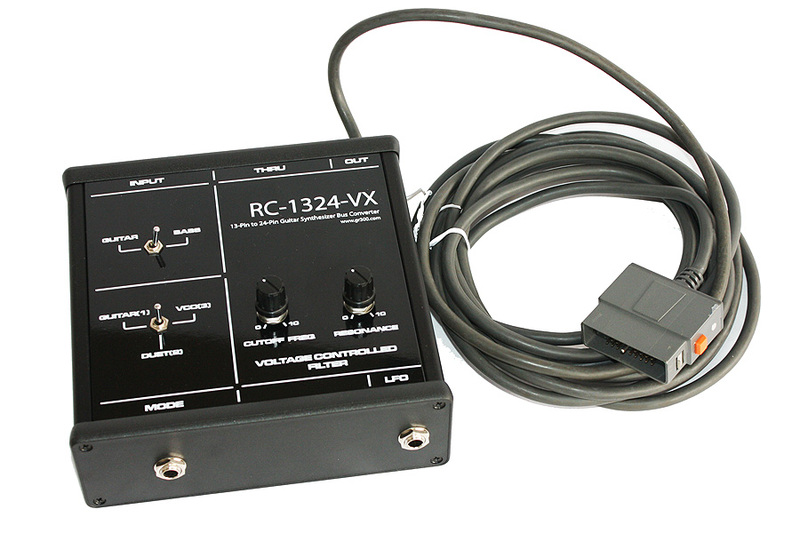 The new RC-1324 converters came in two versions, the RC-1324-VX which featured an attached 24-pin cable, and the RC-1324-VC which used a more traditional 24-pin male connector, like the earlier RC-1324 and the RC-1324-PDL series. The top panel LFO modulation depth control returned to the design, and a new, dedicated 1/4" output for the guitar was added. 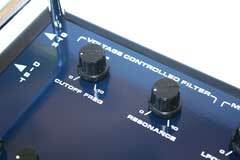 The balance control for gtr/synth was always 100% from the vintage Roland synthesizer. 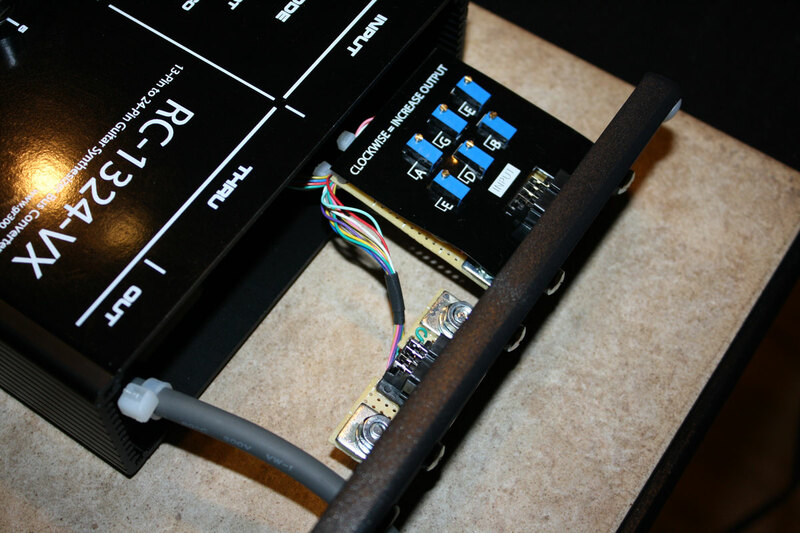 In an effort to simplify the wiring and reduce the size of the unit, the string input controls were configured as six small, precision input trimmers, built into the input board. To adjust the input level on the RC-1324-VX or VC, it is necessary to remove four screws and pull the input panel out slightly. Towards the end of 2009, the last major revision of the RC-1324-PDL was released, version 3. Version 3 had some updates that had been requested when building the version 2 unit. Most notably, there is a bass or guitar input switch on the back, used to offset the string input signals by one position to accommodate the modern Roland bass pickup. 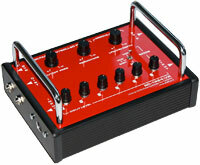 The mix/balance circuit was also changed, adapting the design of the mix/balance control in the GK-1. 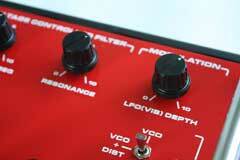 With this change, a pedal could be plugged into the RC-1324-V3 to change the guitar to synth balance. 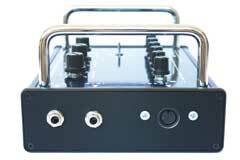 The hex fuzz output jack was redesigned as a tip-ring-sleeve insert jack, so a pedal could be used to control the hex fuzz level, or an effect could be inserted in the hex fuzz signal chain. Click here to watch a YouTube clip of the RC-1324-PDL-V3 with a Xotica BX-1 (GK-3) and the Roland GR-300. 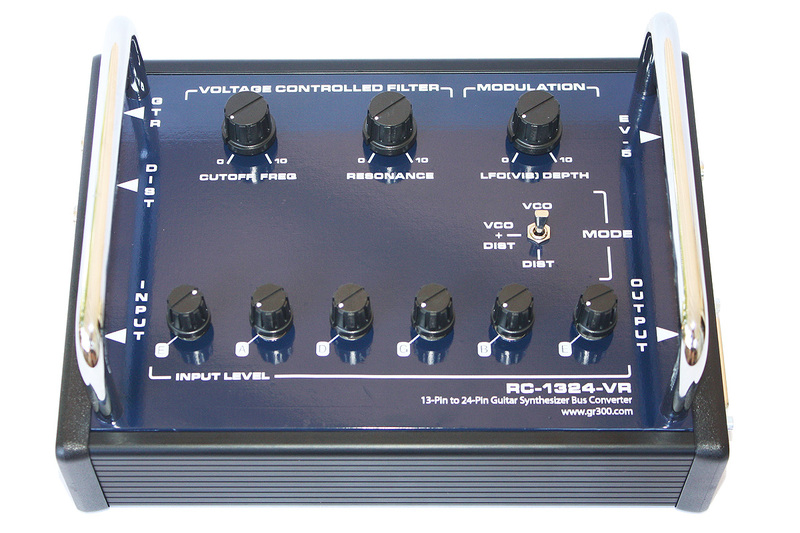 The first RC-1324-VX was a test prototype, made in the summer of 2009 to meet a specific need: I was writing an article for Premier Guitar magazine comparing the VB-99 with the GR-33B, and I needed a way for one bass to play both synthesizers at the same time. 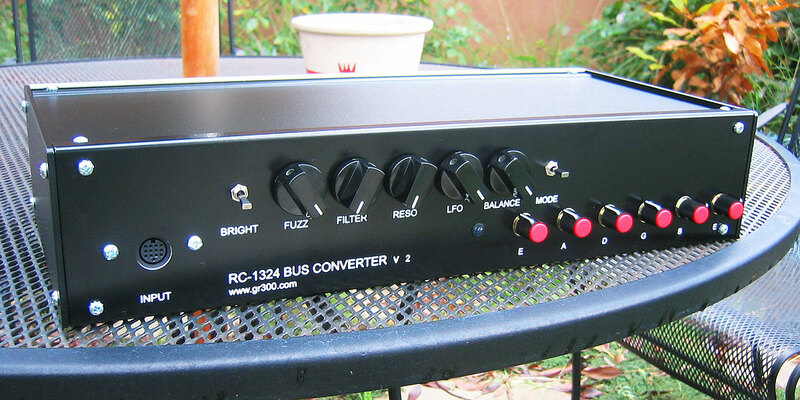 The RC-1324-VX Prototype was made to fit the bill: I used an output cable from a Roland GK-1 rig, and I included a bass input switch right on the top panel, so that a Roland GK-3B equipped bass could used. This unit did not have a LFO depth control, but required a Roland EV-5 pedal for LFO modulation. 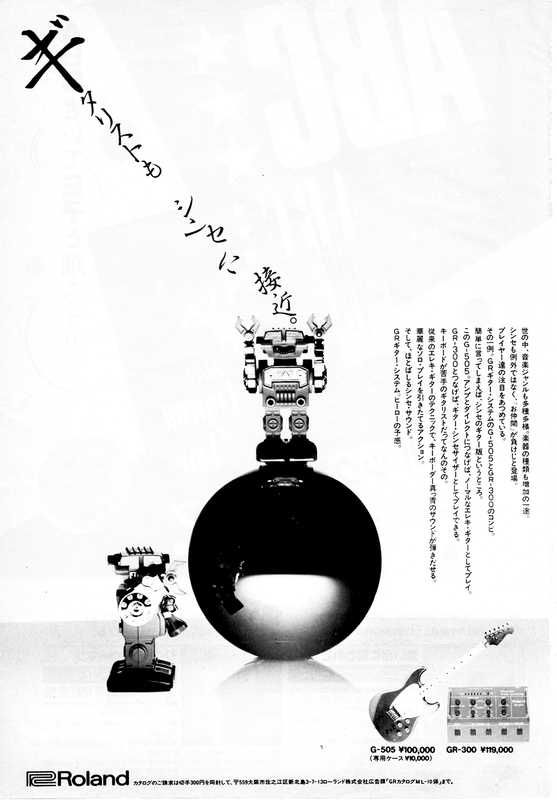 And the "mode" switch was specifically labeled for the GR-33B bass guitar synthesizer: "guitar" "duet" and "single VCO." 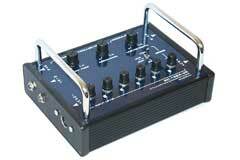 And a foot switch could be plugged into control the mode as well, a feature find only on the RC-1324-VX-Prototype. The RC-1324-VX also had a 13-pin through port, so that the bass controller could play both a vintage 24-pin synth and a 13-pin synth at the same time. 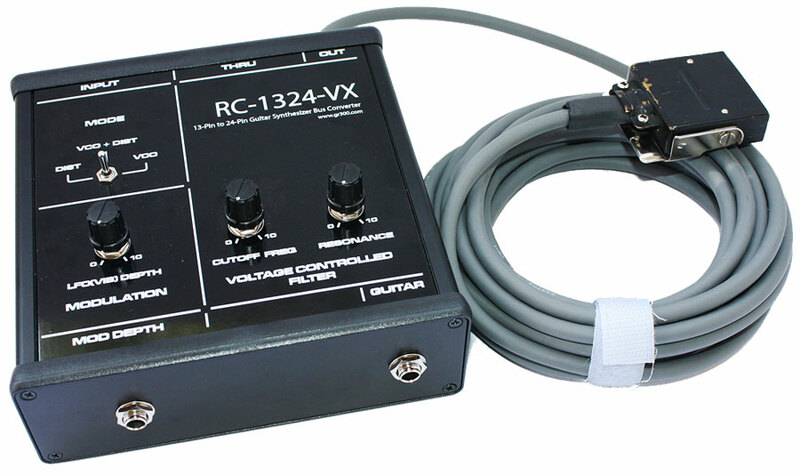 The RC-1324-VX had a new, simplified hex fuzz circuit, based on the Roland G-202, but the distinguishing feature of the RC-1324-VX is the fact that the 24-pin cable is permanently attached to the unit. YouTube clip RC-1324-VX Prototype General Overview. YouTube clip RC-1324-VX Prototype with Roland GR-33B Vintage Bass Synthesizer and VB-99 Modern Synthesizer. YouTube Clip RC-1324-VX Prototype detailed. In the summer of 2008, feature creep began to take hold, and I was ready to increase the features of the RC-1324-PDL. 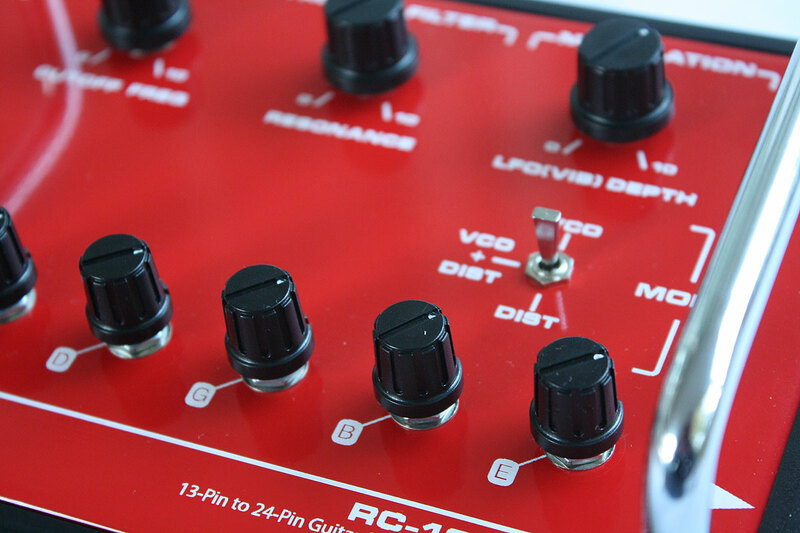 The hex fuzz circuit board from the original RC-1324 came back in the new RC-1324-PDL-V2, along with the fuzz bright switch, separate hex fuzz output, and hex fuzz level control. Adding in the hex fuzz card took away the preset balance controls, as one of the balance controls was replaced with a hex fuzz level control. By adding in the hex fuzz card, the RC-1324-V2 now had all the features of the original Craig Anderton upgrades: a brighter hex fuzz switch, a separate hex fuzz output, and the option of using a foot pedal to control LFO depth. In the fall of 2008, George Ludwig asked me to make a custom RC-1324-PDL with an interesting feature: a DB-25 pin output, and a custom DB-25 to proprietary Roland 24-pin cable, a design that would be the defining feature of the RC-1324-VR, the last RC-1324 unit. Click here to watch a YouTube clip of the RC-1324-PDL-V2 with a Xotica BX-1 (GK-3) and the Roland GR-300. After selling a few of the original units, I decided to make a few small changes in the next production run. The RC-1324 was being primarily used with the Roland GR-300, or GR-700, neither of which support pitch bend commands, so the original "pitch" control knob (control voltage 3) was removed, and in its place I added a volume control for the hex fuzz. 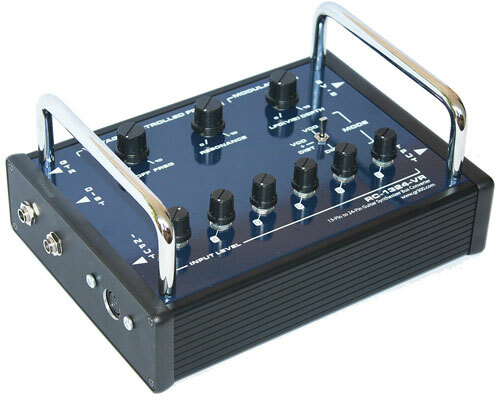 It often seemed to me that the hex fuzz signal could dominate over the synth sound in the GR-300, and adjusting the hex fuzz volume would be useful. The front and rear panel were swapped for a black faced front panel, and for good measure I also added a blue front panel power LED. Click here to watch a YouTube clip of the RC-1324-V2 with a Parker Nitefly guitar with factory Roland GK-2A. Thanks to the success of the shop in Culver City that was making the RC-1324 rack mount panels, I had to start to looking for an alternative enclosure. When I first happened on Lazer Image, it was a small store front operation with Dale, the owner, and one employee. I remember there was a white board with a job list, and tasks were assigned to "Donkey" or "Ogre." In 2006 Lazer Image expanded, moving to a much larger location on La Cienaga Blvd in Los Angeles, and they primarily focused on large industrial projects. I realized how lucky I was to have Dale charging such a reasonable fee for the metal engraving he did on the first RC-1324. 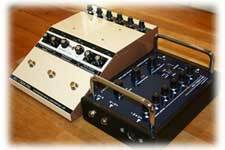 So in the fall of 2006 I decided to try a larger version of the two-toned cabinet used for the BX-13 to make a pedal version of the RC-1324. Since I now had a floor enclosure, I decided to add foot switches, plus two features not found on the rack mount: filter presets, and mix presets. 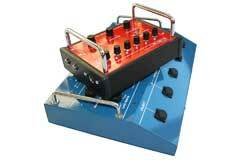 The mix preset was great for switching from all guitar, to all synth, at the press of a switch. Something that was not possible with the GR-300 alone. 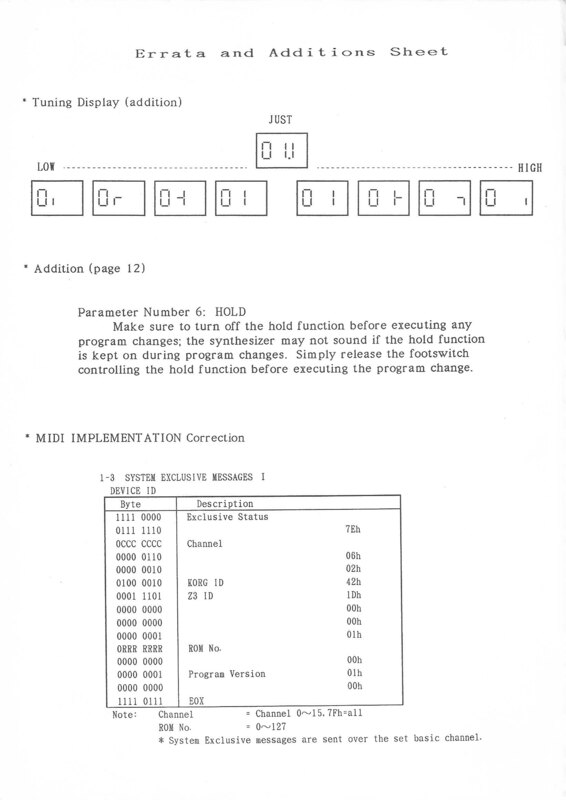 The initial RC-1324-PDL did not have the hex fuzz circuit. Click here to watch a YouTube clip of the RC-1324-PDL with a Godin ACS Quilt nylon string guitar with the Roland GR-300. 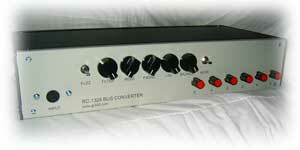 The first unit that I made, and sold to Vernon Reid, was a rack mount version. 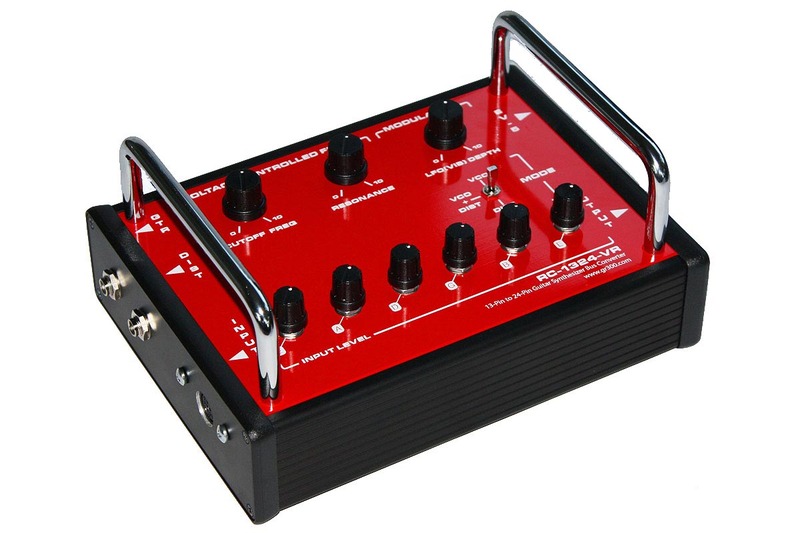 There was a hex fuzz "bright" switch to mimic the Craig Anderton modification of removing the filter capacitor from a vintage guitar controller to make the hex fuzz sound brighter, plus controls for filter, resonance, pitch bend, lfo, mode and a guitar/balance control knob. 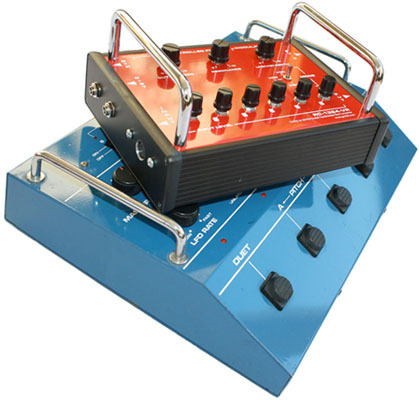 This unit was very much a blending of Mark Smart's circuitry, with the original G-303/808 circuits, and some other essential circuitry, like a specific circuit to scale the 13-pin volume control to the 24-pin level. There were three small pc boards in the RC-1324, one for power, one for the hexaphonic fuzz, and one for the string amplifiers. On the real panel was the 24-pin output, plus a LFO pedal input, and a hex fuzz output. The initial tests were done with a Brian Moore guitar, since that was the guitar Vernon was using, and I posted a video clip with the GR-700, since Vernon specifically mentioned he was to use his GR-700 with his modern 13-pin guitars. Click here to watch a YouTube clip of the original RC-1324 with a Brian Moore i2.13 guitar. This clip was made to demonstrate the RC-1324 to Vernon Reid. The RC-1324 was a pretty new idea, and at the end of the year, I was contacted by someone from the Pat Metheny organization to build one for Pat. I built a unit, with a sticker on the back noting "Custom built for Pat Metheny," but never got a call from the guitar great asking how to use the unit! 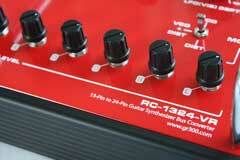 The RC-1324 circuit has been tested with a wide variety of 13-pin guitar synthesizer controllers. 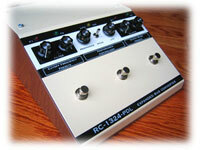 The RC-1324, like the Roland GR-300, works best with magnetic pickups, either the GK-2A or the GK-3 package. With the most recent RC-1324-VR ("RED"), I observed that the input level for the Godin LGX-SA is less than the Roland GK-3. Input levels were around to 10 o'clock to 11 o'clock position. If the ideal input level is exceeded with a Roland GK pickup, the GR-300 becomes overly sensitive, making it difficult to play cleanly. With the LGX-SA, if the ideal input level is exceeded, there is no input. If the input is too high, the red string LEDs on the GR-300 will not light up, or indicate any input signal. YouTube video clip on input levels. An additional note, on the Godin Multiac Nylon SA, there is a ground loop (hum) produced when using the 1/4" output from the guitar at the same time as using the 1/4" output from the GR-300. Roland: GK-2A, GK-3 and Roland-Ready Strat, and any guitars with Roland GK-2, GK-2A or GK-3 electronics, such as the new Roland GC-1 guitar. Mark Smart's original GK-2A to GR-300 circuit. More than 30 years after its introduction, the GR-300 remains the gold standard in analog guitar synthesizer technology, with virtually flawless tracking and no latency. 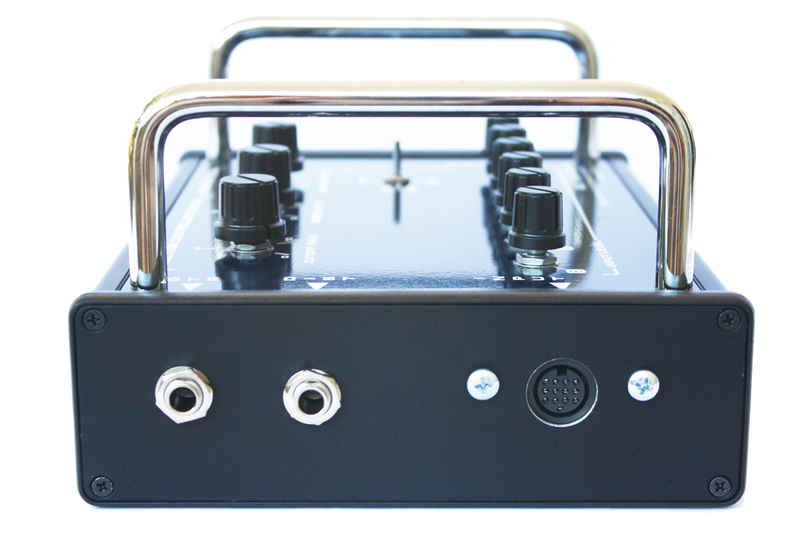 Its organic, responsive analog sound has made it an essential tool for guitar players like Pat Metheny, Andreas Oberg, Robert Fripp, Andy Summers and others. 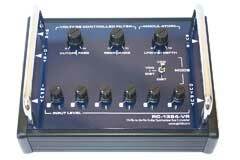 The RC-1324-VR is a bridge between modern 13-pin equipped Roland Ready guitars and classic, vintage 24-pin analog guitar synthesizer technology like the GR-300. The Parker PM-10 guitar is the controller, with a RC-1324-VR converting the modern 13-pin format to the vintage, 24-pin synth format. 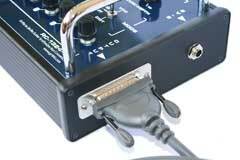 The GR-700 has a DB 25-pin input, so the RC-1324-VR plugs directly into the GR-700. I multi-tracked the GR-700 with Digital Performer, using the GR-700 to play strings, analog pads, bass and more. The tune is "James" by Pat Metheny and Lyle Mays, from the PMG album Offramp. 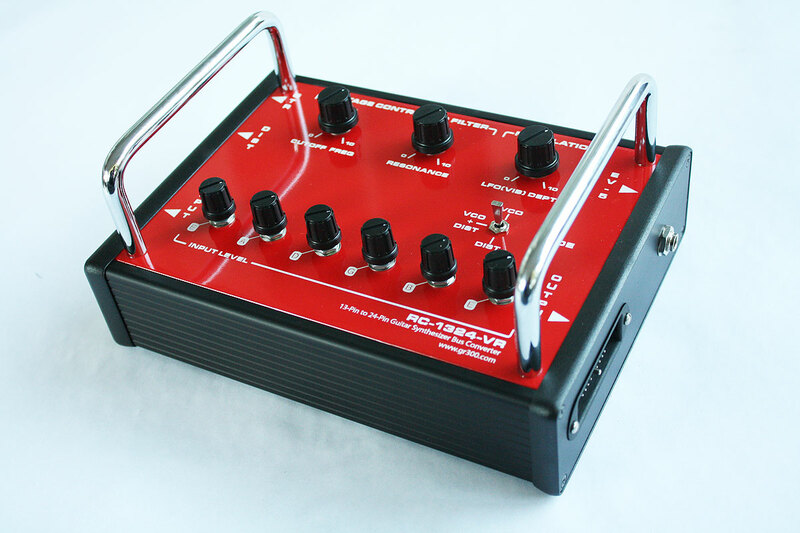 The US-2 Turbo is a modified Roland US-2, designed to be used with the RC-1324-VR, 13 to 24 pin guitar synth converter. .
To be compatible with the RC-1324-VR, the rare, 24-pin connectors have been replaced by common, DB 25-pin connectors. 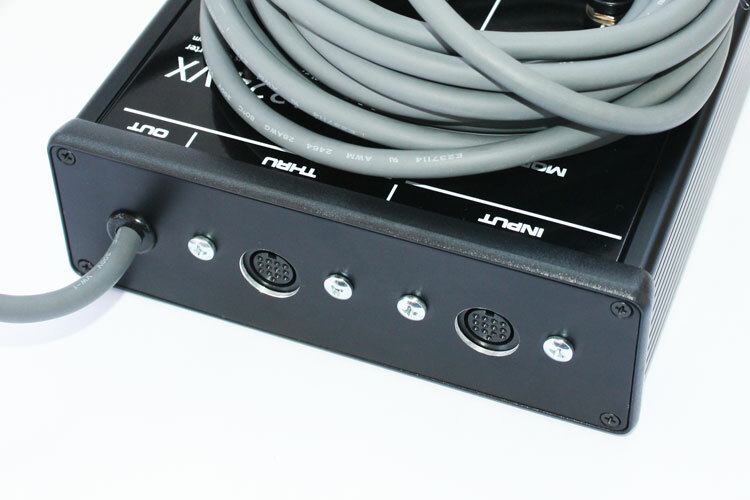 Just like the RC-1324-VR, this allows the US-2 Turbo to be used with commonly available 25-pin cables, in place of the ultra rare, very expensive proprietary Roland 24-pin cables. 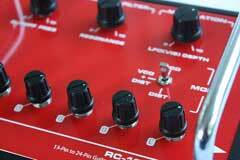 The RC-1324-VR also has its own hexa fuzz distortion sound. Unlike the earlier RC-1324-VC or VX, there is now a multifunction, tip-ring-sleeve jack for the hexa fuzz distortion. .
By plugging a standard 1/4" guitar cable into the first "click" you can output the hex fuzz sound for additional processing. 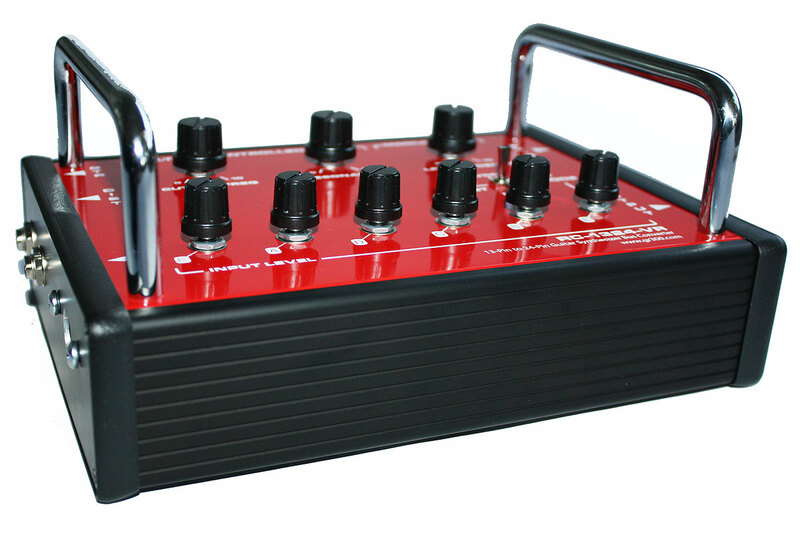 The hex fuzz sound is always available, even when using the RC-1324-VR with synths the like GR-700, which did not include the hex fuzz sound. The RC-1324-VR ships with a D-sub 25-pin output, and a special D-sub 25 pin to 24 pin Roland proprietary connector. The cable is the Belkin F3D, high-speed, shielded data-grade cable, superior to the original unshielded Roland cable. I have been using Belkin as my replacement cable when rebuilding Roland cables for years, without any failures. The cable is 10' long, but it can easily be lengthened by using readily available Belkin cables with male and female 25-pin connectors. 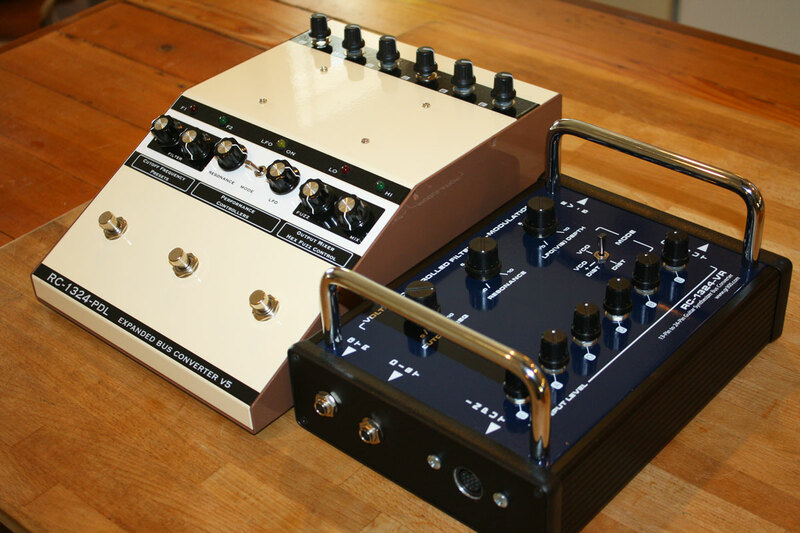 While there has been no improvement in analog guitar synthesizer technology since the GR-300 premiered in 1979, guitar fabrication and construction techniques have continued to make strides. Check out this comparison of an original Roland G-303 guitar and a Fernandes Sustainer equipped Dragonfly Elite. 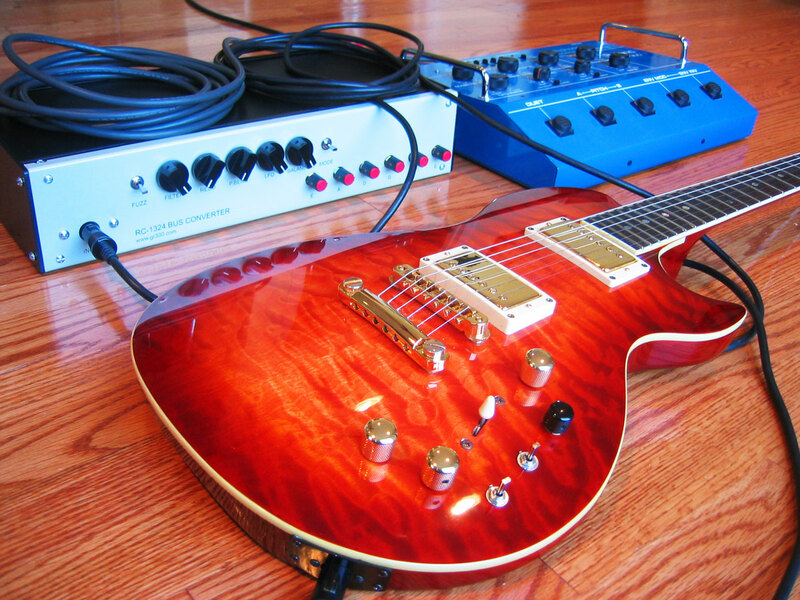 The RC-1324 circuit has been tested with Roland GK-2/2A/3 magnetic divided pickups, and piezo based systems, like the RMC/Godin/Brian Moore guitars. As shown in the video clip, the input window for the Godin LGX-SA is smaller than te Roland GK-3, and the input control needs to be below 50% (12 o'clock position). Also, the G-202 style hex fuzz circuit in the RC-1324-VR does not work with signals from the piezo pickup.